Warmer weather means it’s time to get outside and explore all that Mother Nature has to offer. Southwest Michigan is a gem when it comes to the abundance of beautiful parks, preserves, and natural settings. There are plenty of paths suitable for hiking and biking. Whether you are looking for an easy enough path for a toddler or something a little more challenging and rugged, we’ve got it covered. Remember to check opening and closing times for each location. Have handy essential items such as water, sunscreen, and bug spray. Admittance to the following locations are free, unless listed otherwise. Use this map of area hiking and biking paths to plan your next outdoor adventure. Hiking trails are marked with the yellow hiker symbol and biking paths are marked with the purple biker symbol. Grab the gear and find an adventure at one of these popular hiking destinations. With over 25 miles of trails, there is something for every level at Al Sabo. You and the kids can ride bikes on the marked baths, or you can enjoy a scenic walk. Find a bench along the paths – a perfect stop to rest little feed and take a snack break. An easy one-mile hike through beautiful and largely untouched woods is what you will find in the hidden gem, Kleinstuck Preserve. This is perfect for preschool kids, as they will delight at the fallen tree balance beams, the large teepee made out of sticks, and the almost guaranteed deer sighting. Note: there are no restrooms at this trail. Pull on rain boot and take a stroll through paths that lead to a scenic view of West Lake. Portions of the bog trail are floating on water, and kids love the water that squirts up through the planks as you walk the trail. There is a playground at the trailhead and a pavilion with restrooms. Make your way through the wildflower prairie maze just east of the Oshtemo branch of the Kalamazoo Public Library. Enter the trail from the parking lot of the library, and you can follow it all the way to the Oshtemo Township Park trails and playground, or loop back around to the library. You may have been to the Fish Hatchery to feed the fish or take a tour, but the often overlooked trails are a great way to explore with the kids. Make sure to snag a scavenger hunt guide in the visitor center. There are bathrooms in the visitor center, and the paths are stroller friendly. Established on abandoned agricultural land, the 716-acre forest is an ideal location for a hike when you want to feel completely immersed in nature. We love the covered bridge at the entrance for fish watching and the stream, too. For hiking, there is a changing landscape and may not be the easiest to navigate with younger children or strollers if you plan to walk the big loop. We love feeding the geese and the ducks in the pond and walking around to explore the property. There is a good walking path that is accessible with strollers. You’ll also find various birds in pens along the paths which are fun for the kids to see. Check out their summer Wednesday night programs for kids. In addition to the indoor exhibit center, there are a variety of trails to hike and a trail map available to guide you along the way. Trails are marked by length and level of difficulty. The nature trails range from 0.2 easy miles to 2.7 difficult miles. This little garden Children’s Garden in Battle Creek is a fun garden to visit with small children. The Children’s Garden is an ever-changing environment where children can explore the world of plants. The larger Leila Arboretum offers spacious paths and landscape to explore. An expansive recreation area awaits at Fort Custer with three lakes as well as the Kalamazoo River, high rolling meadows, soggy wetland, and abundant woods. There are 22 miles of hiking, biking, and horse trails, and campsites. Chipman Preserve is a beautiful location with six miles of scenic trails through forest and grassland. The Preserve is part of the HOP hiking program for kids across Michigan. Here are 9 Bike Paths and trails that offer options to bike your way around Kalamazoo. Boasting over 30 miles of limestone path, the Kal-Haven trail connects Kalamazoo with South Haven. The scenic route takes riders through farmland, wooded areas and over rivers and streams. The trail can also be used for cross-country skiing, hiking and walking or running. The Kalamazoo River Valley Trail is a regional trail connecting parts of Battle Creek, Kalamazoo, and Van Buren County. Currently, there are 22 miles of paved, asphalt trail suitable for non-motorized transportation. 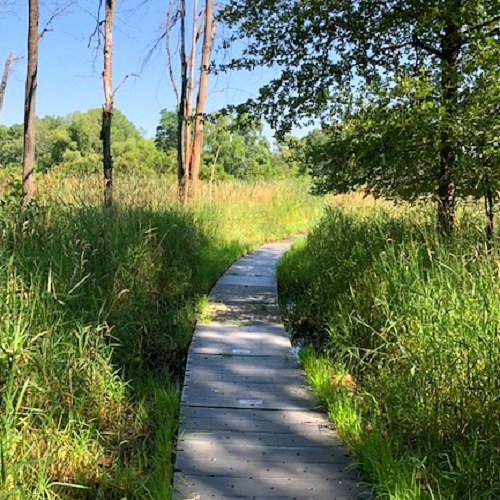 There are multiple spots to get on the trail, including 10th Street, Westnedge Ave., 35th St. in Galesburg, D Avenue, Verburg Park, Riverview Park, and the Kalamazoo Nature Center. The Portage Bikeway connects over 55 miles of off-road trails and bikeways throughout the city of Portage. Part of the bikeway is on regular city streets and part of the bikeway is on a separate, off-road paved trail for pedestrian and bike use. There is a four-mile stretch of trail, the Portage Creek Bicentennial Trail, that is kept clear in the winter months, along with a stretch of trail between Romence Road and Constitution Boulevard. Make sure to use the full Bikeway Brochure. The Eliason Nature Reserve is a 123-acre property offering a combination of uplands and wetlands and is part of the Bishop’s Bog complex, which is registered with the Nature Conservancy. The paved trail is spacious and allows for easy passing of walker, joggers, and bikers. Enjoy the beautiful scenery of over 40 acres. There are paved paths around the park as well as playgrounds, tennis courts, pavilions, and summer entertainment. Beginner and advanced bikers will enjoy riding the five miles of single track trails around the Maple Hill Bike Track located on the west side of the park. In addition to the bike trails, there is also hiking, playgrounds, tennis and a sandy beach to cool off at. A great access spot to bike with younger kids is Lakeview Park. There are paved paths across the park perfect for little bikes or strollers. Afterward, you can play at the two playgrounds or go out on the pier overlooking Austin Lake. Linear Park in Battle Creek boasts over 26 miles of paved trail for biking, jogging, and general recreation. The trail goes around much of the greater Battle Creek area, so visitors to the trail can hop on nearly anywhere. Free parking with easy access is located near Friendship Park in downtown Battle Creek. If your family is looking for a shorter ride, the Vicksburg Trailway is a 1.8-mile paved trail through scenic woodlands and northeastern Vicksburg neighborhoods. A portion of the trail passes through the Vicksburg Recreation Area, with areas for picnics, nature trails, and disc golf. Make sure to stop at the Vicksburg Depot Museum to check out unique artifacts related to the area’s railroad history. For bike enthusiasts, the Albion River Trail provides a fun, shorter ride for families looking to get out together and ride. This trail is 1.6 miles of paved 10-14 feet wide paths conducive to walking, bike riding, running, rollerblading, and skateboarding. For a unique view, hike the scenic ledges at Fitzgerald Park. Featuring three miles of hiking (plus a nature center), biking trails, disc golf course, playgrounds, horseshoe pits and spectacular views of the registered Michigan Historic Site. This 14-mile trail features paved and unimproved grass trail along the old Toledo and South Haven Railroad. Although some of the trail is grass, it is well-maintained. Fat-tire bikes are best for this trail.